In the not too distant past, owning a 4K monitor was well out of the reach of many of us. But with newer cheaper models coming onto the market the possibility of owning a high resolution monitor is coming into the reach of non-enthusiasts. They aren’t cheap but you don’t necessarily have to pay the large premium that you used to. ASUS have been keen to extend their 4K line and the MG24UQ is the latest in the MG range. As well as the high resolution screen, it also features Adaptive-Sync technology and an IPS panel. This technology tends to give better visual images but at the cost of response time. Playing games at 4K is still going to need a beefy graphics card so we’re still not quite there when it comes to accessibility for the casual gamer. The current mid range cards are getting there but you really need a modern high end GPU to get the best results. But gone are the days where you needed two enthusiast level cards to get playable 4K results. The MG24UQ is good looking enough it isn’t a break out design by any means but the off black colouring with hints of red are aesthetically pleasing without having an over the top “gaming” feel to it. You’ll find slimmer bezels out there but it’s the stand that I think is this model’s best looking feature. Perhaps it has a slightly larger foot print compared to other 24″ screens but it is fully adjustable which is always a big plus in my book. I’m struggling with a static monitor on my desk and I do miss the ability to position it. The ASUS includes three HDMI inputs and a single DisplayPort 1.2. Only one of the ports is HDMI 2.0 which has the required bandwidth to displaying 4K at 60hz so you’ll need to hook up this or the DisplayPort socket to avoid being limited to a mere 30hz at 3840 x 2160. Headphone jack and a bog standard pair of speakers are included even if most gamers will be planning to hook up a decent pair of headphones to go along with their new monitor. The MG24UQ boasts a flicker-free display and an ultra-low blue light which is supposed to provide increased viewing comfort over long periods. Like most monitors the out of the box performance is not optimal and professional reviewers recommend some calibration to get the best results. Fortunately this can all be done fairly easily via the on screen menus. The display reportedly gives good blacks, sometimes a weakness of IPS panels, accurate colours and wide viewing angles as expected from this technology. Testers have also shown that the MG24UQ is a top performer when it comes to low input lag. Whilst this used to be an issue with some IPS monitors this model shows what Asus can do with their gaming line of screens making this model even easier to recommend. The inclusion of Adaptive-Sync will also be appreciated, you’ll need a compatible AMD card to benefit but if yours is relatively new it will ensure you get smooth tear free images. As long as you graphics card can keep the frames coming between 40 and 60 frames per second the adaptive sync tech will ensure the screen displays them as fast as they are rendered. Particularly useful for 4K where it is highly likely your GPU won’t keep a steady 60fps. The monitor’s Trace Free setting can be used to optimise blur effects. Different settings will have different in game results so worth playing with as owners report this can really improve the image quality when set correctly. The Asus GamePlus mode is included on this model which provides a number of gamer friendly features that you may or may not find useful. This includes cross hair, timer, and FPS counter. The former may even be frowned upon in some professional gaming circles but it’s there if you need it. In addition to this, you also get ASUS GameVisual technology which provides you with numerous configuration presets for those that don’t like fiddling with the setup buttons round the back. With a variety of modes to chose from hopefully there will be one to suit your favourite games. We give the ASUS MG24UQ a 4.5 out of 5 rating. Want to know what existing owners of the monitor think? You can read real user reviews here. Should I buy the ASUS MG24UQ? The cost of 4K gaming is falling and monitors like the MG24UQ are putting this technology into the hands of everyday consumers. You'll still need a top end graphics card to get high quality 4K images but it makes sense to future proof yourself and get a 4K screen now as graphics cards that can handle this resolution will only get more affordable. 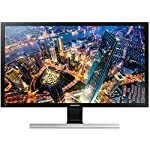 This monitor breaks ground with it's great price, inclusion of gamer friendly features and high performance IPS panel. A real winner. If you are having some doubts about this purchase then why not read some real owner reviews and see what other buyers think. Welcome to the ASUS MG24UQ FAQ. This section attempts to answer common questions you may have, please get in touch if you have any more queries or if you think our answers need updating. 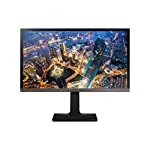 Can I use this monitor for professional applications as well as games? You can but note that your apps may be scaled to fit the high resolution. Very few apps are designed with 4K in mind and potentially you might find things look small on a 24″ screen. You can always run the monitor at 1080p and revert to 4K for games but you might lose some fidelity when scaled back to HD.